As I have just turned sixty two years old, I have memories of Park Island and wasn't happy about the days when they tore it down to build extremely modern housing, I will never see them as homes for my needs are very basic. my husband and I own a great small log cabin 620 square foot. , I loved it the moment my husband opened up the door and I knew that he was the best friend and husband, we've been married for eleven years and we are still on our honeymoon forever. Wish I would have seen this site years ago, I have been hosting Historical Boat Tours on Lake Orion, from Orion Marine for about 3 years now. If you have any old photos or stories of the Lake or Park Island I would love to talk to you I'm always looking for more information for my tours. I am one of the granddaughters of Arthur Slyvester Widrig And the daughter of JeanneAdeline Widrig and Russell Charles Marshall Jr I find the information i read very interesting as I don't know very much and have been trying to find out for years. 12/23/2010 - Russell C. Marshall Jr. In the 1930's Arthur Sylvester Widrig was in partnership as an owner of Park Island along with Indianwood Golf Club. The partnership also held title to several hotels and properties in other states including Florida and Georgia. Although few people knew of it there may have been a connection between this partnership and some undesirable individuals that were well know in the notorious underworld. All of these people are long gone now and many people find it interesting that a relative may have been a wee bit crooked. I am one of those people and I love the history of the little village and lake where I spent the summers of my life growing up. Arthur Sylvester Widrig is my grandfather. There were several Islands on Lake Orion and one of them held a Hotel as they were better called that was named Comfort Hill, I would like any information on this establishment. It is rumored that there were guests such as Al Capone, George Nelson and Members of the Purple Gang that frequented this establishment. Any pictures you may have or know about would be greatly appreciated. 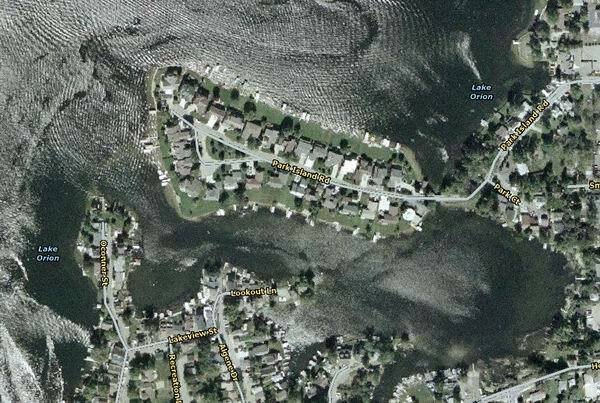 I lived in Lake Orion most of my life and can remember when you had to walk the wooden bridge to Park Island. Excerpt from the book Images of America - Lake Orion by James E. Ingram and Lori Grove. Click here to order it! Part 1: The Detroit and Bay City Railroad in 1872 set the stage for Lake Orion as a major summertime resort. In 1874, E. R.
Emmons and several prominent citizens formed the Orion Park Association. They developed a park on the shore of the lake in the village (now Green's Park) and operated a steam-powered launch for lake excursions. They purchased Island Park (now Park Island) and constructed a bridge to the island where they built a 100-foot-long reception hall topped with an 8O-foot-high observation tower. In a natural amphitheater that seated several hundred people, a rostrum was erected for public speakers. The Spiritualists were among those who camped on Island Park each year for religious assemblies before it became a popular amusement park in the 2Oth century. In the summertime, thousands of people per week would arrive to Lake Orion and depart their trains, cross under these arches, board a launch, and be taken to their hotel or cottage. It was the purchase of Park Island by John Winter in 1911 that established the amusement center on the island and developed the Main Landing next to two tracks of railroad, as seen in this panoramic view, as the entrance to the summer resort. A fleet of passenger launches and the Lake Shore Cafe are shown on the left, and the Lakeside Hotel, operated by the Green family, was located just north of the Main Landing. The Michigan Central Railroad depot is on the right in the background. A footpath leads from the Detroit Urban Railway platform in the foreground to the entrance arches. John Winter, who owned Lake Orion Summer Homes Company and kept a sales office here, sold this property to the Village of lake Orion for $9,000 in the 1930s, and it became Green's Park. The lake side Hotel was operated by the Green family, for whom the park is now named, from 1900 into the 1930s. It was a small hotel with 10 to 12 rooms and a dining room, and prior to 1900, it operated under a different name. The building became a doctor's office in the 1950s and was torn down for an expansion of Green's Park in the 1980s. Visitors could also linger at the Main Landing at lakeside Rest Pavilion or rent a canoe, rowboat, or launch at a moderate rental by the day, hour, or week The Michigan Central Railroad depot for steam-powered railcars was on the southeast corner of M-24 and Flint Street and torn down in the 1960s for a building erected for A&P Food Market (now occupied by AutoZone). The Detroit United Railway passenger depot was located on the southwest corner of M-24 and Flint Street, adjacent to the Main Landing (the current location of Orion Marine). John Winter and Dr. O. Lau were instrumental in having the Detroit United Railway line run from Rochester to Lake Orion in 1900, and the depot was built shortly thereafter. The Detroit United Railway ran throughout southeastern Michigan, and from Lake Orion, it ran north to Flint and into the thumb region, or Saginaw. A foldout brochure was circulated via the US mail in 1914 to advertise Lake Orion's amenities as unsurpassed in all Michigan and easily reached via rail and electric lines for healthful amusements, summer comfort, splendid views, desirable hotels, summer cottages for sale and rent, and its fleet of passenger boats. Families were assured that the safety and comfort of ladies and children are made the special concern of the management. Lake Orion was also stocked annually with bass, pickerel, and pike, and fishing contests were held seasonally as well as amateur photography competitions of scenic Lake Orion views. With the lure of its natural setting for picnicking and leisure amusements, it was likely very conducive for one to be detained in Orion. In many brochures and newspaper travel articles, it was advertised as the Venice of the Middle West, Paris of Detroit, and Lake Orion, the One Best Resort. Part 2: Park Island was the destination of launch and excursion boats where passengers were unloaded to spend the day at the amusement park. At the Park Island landing, passengers disembarked beneath its arches for amusements and dancing. Behind the arches was the building that housed the penny arcade and souvenir booths. The building above the landing housed the carousel. A penny arcade allowed one to play a video-type game for a penny, except in 1915, one had to crank it by hand. Many buildings were adorned with decorative elements characteristic to Park Island, such as the truncated pillars on the rooftop that are strung with hundreds of lights for illumination at night. The Orion Light and Power Company, established in 1901 by John Winter and Dr. O. Lau, initially furnished electricity for the resort and village. In 1912, it was purchased by the Detroit Edison Company under which name it remained in operation until the 1950s. Visitors on Park Island could mill between buildings and booths and find activities of their choice. 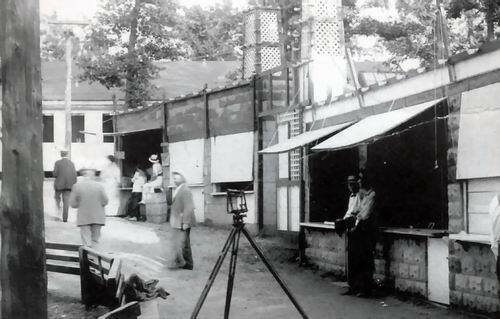 In the style of an open-air market, an aisle of booths was used for various games and souvenir shops in the 1920s. There were also refreshment booths, lunch stands, and a dining room on Park Island. Japanese Rolling Ball was a very popular game. When asked about recollections of Park Island, most people recall playing this game and the type of prizes they won. Marie Shoup, village resident, described the game as rolling billiard-sized balls into certain holes for a cumulative score with which one would win prizes that varied from Kewpie dolls to fine pieces of china. Women residing in Lake Orion could acquire many pieces of china this way, and sometimes a complete set! 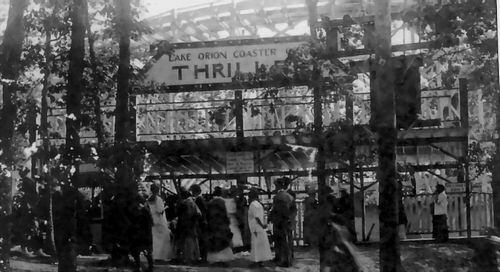 The Thriller roller coaster was another of the main attractions on Park Island. 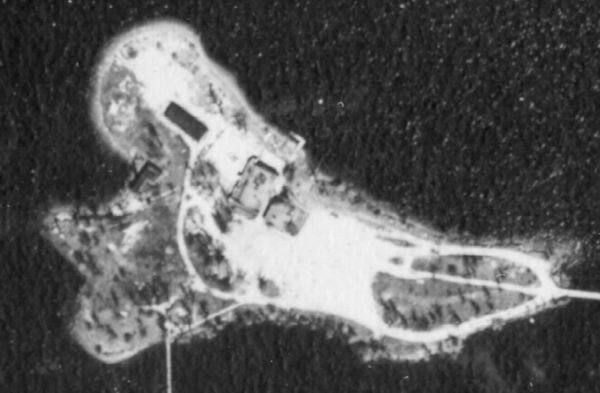 It was located at the southwest corner of the island and towered above the trees. Former resident Barbara Wilson-Benetti recalls, When the cars hit the long drops, the metallic rattle of the acceleration carried across the water quite plainly, like a keg of nails being poured down a brick chute; and along with it came the high-pitched screams of the girls. These came out as one sound, a long 'R-r-r-r' as the car fell and simultaneously a high 'E-e-e-e' trailing out behind like a ribbon. A footbridge ran from the back side of Park Island near the Thriller to the current location of Algene Street on the mainland. Algene Street is named after Al and Geneva Dacey, who lived on this street in the 1920s through the 1950s. A dance pavilion was one of Park Island's most enduring attractions and attracted major bands such as Butler's Band from Detroit and Logan's Lansing Orchestra. 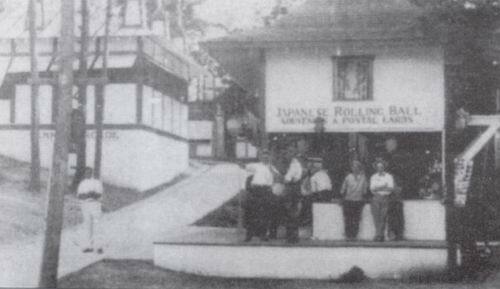 Over the years, three dance pavilions were built on the island. After the first was destroyed by fire, it was replaced by a second, more elaborate pavilion with 5,000 square feet of floor space. On the Fourth of July weekend in 1936, the second dance pavilion burned to the ground in one afternoon. It was said that it burned so fast the band did not get their instruments out. The dance pavilion was again rebuilt, and it continued to attract major bands into the 1940s. 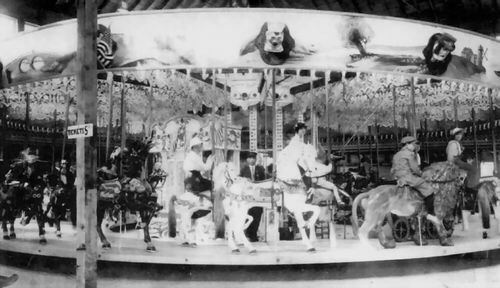 The $12,000 carousel was purchased by John Winter for the Park Island Amusement Park in 1915. Some of the beautifully crafted horses had real horsehair for tails and moved up and down as the carousel rotated. Toward the center of the carousel were carriages in which people could also ride and benches where the less adventurous could sit. Vincent Borelli, standing in the center, ran the carousel. He was Italian and allowed only Italian opera music to be played for the carousel's operation. 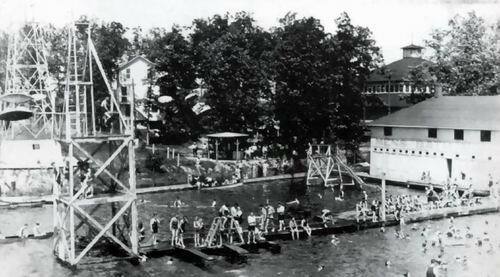 The swimming beach located on the north side of Park Island had both a men's and ladies' bathhouse in addition to a two-story observatory. It also had a large L-shaped dock with several diving boards and platforms. The highest of these at the very end of the dock was 42 feet, and lifeguards would put on diving exhibitions late in the afternoons. The carousel was housed in the building seen in the background. The Park Island beach boasted the largest waterslide in Michigan located next to the ladies' bathhouse. Bathing suits could be rented from the bathhouse. At night, Park Island became an illuminated park. It was strung with thousands of lights, and it was said that the myriad lights transform the islands and shores into a veritable fairyland. Firework displays exploding against the dark sky were a frequent nighttime event over the lake. The origin of Lake Orion's name is purportedly taken from the night sky. In 1911, J. A. Treat reported that his father, while an Orion postmaster, suggested the name of Orion because it was short, handy to write, and 'altogether lovely,' it being the finest constellation in the heavens. Prior to this name change, Orion had also been called Dogway due to a quantity of mongrels in the business district. 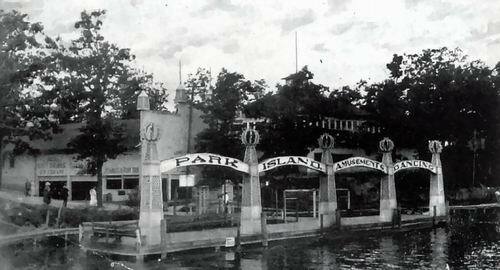 There were at least three summer cottages on Park Island when the island became an amusement park, and they were used to house employees of the park. A cottage on Park Island was high on a bluff with a sizable boathouse and dock at the water level. A two-story cottage had a wraparound porch on both levels to enhance the vista of the lake. The wraparound porch was a common architectural feature of the early Lake Orion cottages. 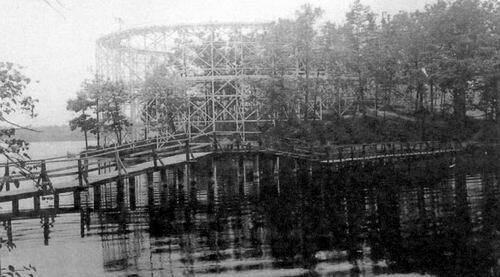 In the 1930s, due primarily to the Depression, Park Island as an amusement park descended into steep decline. The rides and most of the buildings were being torn down. A toboggan slide was made of lumber from the old Thriller roller coaster. It was erected on the north side of the island in the late 1930s. The toboggan run shot toboggans down onto the ice where they would glide almost to Green's Park in the village. Winter activities on Park Island in the 1940s were sport car races and skating races on the ice. Livingston Bud Schaar, a late village resident, recalled ice-skating around Lake Orion as big time when the whole lake was an open skating rink. By 1955, his brother Stid Schaar's bar on Park Island was about the only active establishment and was destroyed by fire that summer. 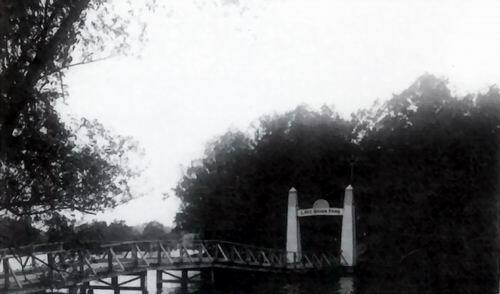 In 1964, Bill Davis purchased Park Island and replaced the wooden bridge with a concrete bridge. 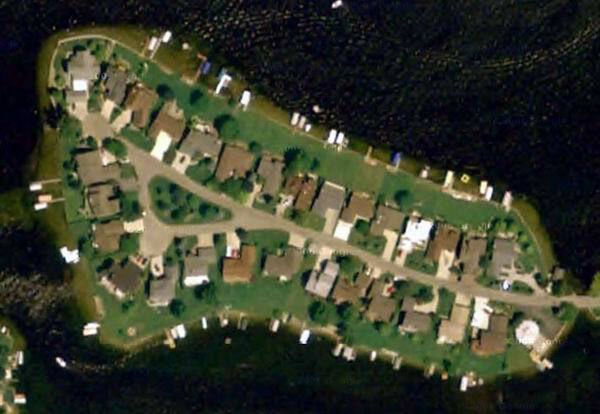 He then developed the island with lakefront homes. 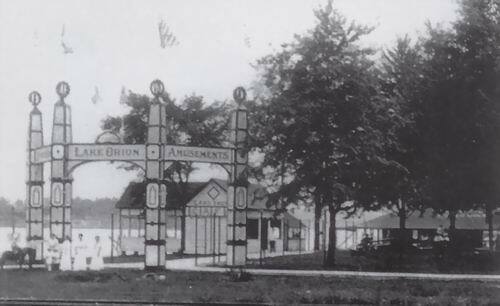 Lake Orion used to have an old amusement park called Park Island. It was a very popular summer resort for people because of the 1,700 acres of Lake Orion. The only access to Park Island was by bridge or steamer. Also with the theme park was a reception and dance hall 100 feet long and 80 feet high. Park Island Amusement Park offered roller skating, dancing, picnic areas, a penny arcade, roller coaster, swimming and power boat tours of beautiful Lake Orion. There was some talk that the owners of the island had ties to the Purple Gang and/or Al Capone!.